Today’s urban and slum residents face a multitude of challenges to their physical and mental well-being. Densely populated slums, home to one-third of the world’s urban population, have underdeveloped infrastructure and sanitation systems and are breeding grounds for infectious disease and vector-borne illnesses. Living in urban areas can cause or worsen non-communicable diseases: air pollution is linked to heart and lung diseases, and lack of access to nutritious food and green space contribute to obesity and diabetes. Violence, transportation incidents, and overcrowding are major risks to physical safety and mental health. 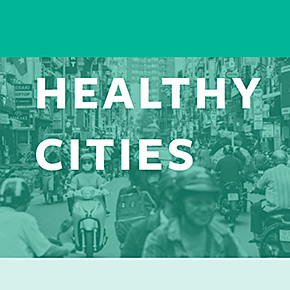 Cities that promote exercise and healthy eating, incorporate green space, limit traffic and crowds, ensure clean air and water, and make health services easily accessible to those most in need, such as the poor and elderly, are critical to the health of all. These characteristics are also critical to reduce costs for local governments, and increase productivity for businesses. New enterprises, technology, and innovation that address urban health risks are integral to designing, building, and retrofitting cities that make people of all ages and abilities healthier and happier.